With three games left in their season, the Edmonton Oilers are on the verge completing what has been yet another disappointing campaign. While nothing can take away the sting of losing, being able to watch Connor McDavid do his thing on a nightly basis has likely helped soften the blow for all of Oilers Nation. Funny thing is, as good as No. 97 has looked during the first 42-games of his career, all signs are pointing to this kid seizing the moment and closing out his rookie season with a special performance. After breaking his collarbone against the Philadelphia Flyers in early November and being sidelined for three months, not everyone seemed sold on McDavid’s ability to return to action and look as though he had not missed a beat. While the injury was severe, it seemed odd that so many thought he would need to readjust. Well, the 19-year old wasted little time in quieting his doubters, scoring on a brilliant individual effort in his return to the lineup against the Columbus Blue Jackets and hasn’t looked back since. McDavid is among the league leaders in points since the All-Star break, 10-23-33 in 29 games, and has been the best player on the ice in most of those games. Prior to his return, I had McDavid slated to finish the season with 50-55 points and a real shot at taking home the Calder Trophy. 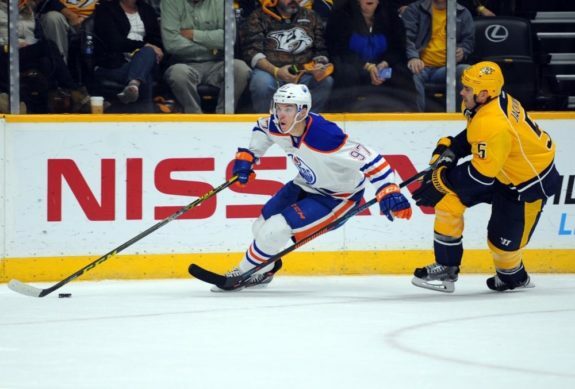 With just over week to go, he remains on track to do both and with the Oilers final three games coming against the Calgary Flames and two with the Vancouver Canucks, things could get real interesting. Elite players tend to pile up the points against bad teams and the 2015 first overall pick is no different. As of this moment, you would be hard-pressed to find two clubs that are playing worse than the Flames and Canucks. Both are limping their way to the end of the season and despite Edmonton’s current position in the standings, my guess is Todd McLellan’s crew will fare quite well in all three of those contests…which all but guarantees McDavid finding the scoresheet with some regularity. Believe me…this kid knows exactly where things stand. Should he come out and string together a productive three-game stretch over the next week and a bit, McDavid will probably become the favourite to win the Calder. If you think for a minute that won’t drive him to be at his best, you are out to lunch. Add that to the fact the Oilers next two games will be the last they ever play at Rexall Place and the moment becomes that much bigger…which tends to bring the very best out of those who are considered to be the best of the best. Part of the deal that comes with being a so-called generational talent is having both the wherewithal and ability to not only recognize those moments when they arise but also seize the opportunity to deliver a memory that stands the test of time. Connor McDavid is that type player and we have already seen glimpses of what he can do when the spotlight is shining squarely on him. Chances are he will continue down that path and it seems fitting to end this chapter in Edmonton Oilers history with a “run” their fans won’t soon forget.